The talk will introduce Emptied Lands (Stanford University Press, 2018), a book that investigates the protracted legal, planning, and territorial conflict between the settler Israeli state and indigenous Bedouin citizens over traditional lands in southern Israel/Palestine. The book places this dispute in historical, legal, geographical, and international-comparative perspectives, providing the first legal geographic analysis of the "dead Negev doctrine" used by Israel to dispossess and forcefully displace Bedouin inhabitants in order to Judaize the region. The book reveals that through manipulative use of Ottoman, British and Israeli laws, the state has constructed its own version of terra nullius. Yet, the indigenous property and settlement system still functions, creating an ongoing resistance to the Jewish state. Emptied Lands critically examines several key land claims, court rulings, planning policies, and development strategies, offering alternative local, regional, and international routes for justice. About the speaker Professor Alexandre (Sandy) Kedar teaches at the Law School at the University of Haifa. He holds a Doctorate in Law (S.J.D) from Harvard Law School. He was a visiting professor at the University of Michigan Law School as well as a Grotius International Law Visiting Scholar there and a visiting associate professor at the Frankel Institute for Judaic studies in the University of Michigan. His research focuses on legal geography, legal history, law and society and land regimes in settler societies and in Israel. He served as the President of the Israeli Law and Society Association, is the co-coordinator of the Legal Geography CRN of the Law and Society Association and a member of its international committee. He is the co-founder (in 2003) and director of the Association for Distributive Justice, an Israeli NGO addressing these issues. Among his recent publications: "Dignity Takings and Dispossession in Israel" Law and Social Inquiry (2016); "Between Rights and Denials: Bedouin Indigeneity in the Negev/Naqub," Batia Roded, Oren Yiftachel, Alexandre (Sandy) Kedar. Environment and Planning A, Vol. 48, pp. 2129-2161 (2016); "The Development Authority and the Formative Years of the Israeli Land Regime," Ela Trachtenberg, Alexandre (Sandy) Kedar and Deborah Shmueli, in Journal of Israeli History, vol. 35, no. 2, pp. 215-243, published online: Nov 2016; "The Reflection of the Israeli 'Incorporation Regime' The Land Allocation Institution in Israel's Urban Area, 1950-1960," Ela Trachtenberg, Alexandre (Sandy) Kedar and Deborah Shmueli, Middle Eastern Studies (2017). He is the co-editor, with Irus Braverman, Nicholas Blomley and David Delaney of The Expanding Spaces of Law: A Timely Legal Geography (Stanford University Press, 2014) in which his "Expanding Legal Geographies: A Call for a Critical Comparative Approach" was published as well as a co-written introductory chapter, "Expanding the Spaces of Law: An Introduction." 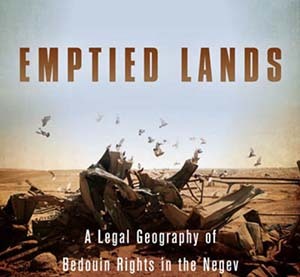 Co-authored book (with Amara and Yiftachel) Emptied Lands: A Legal Geography of Bedouin Rights in the Negev, was recently published (Stanford University Press, 2018).